While everyone is free to hold their own opinion, it’s likely a safe guess to say that most people enjoy having muffins for breakfast. However, most of these wonderful muffin enthusiasts avoid baking and eating them on a regular basis for fear of offending their diet and nutrition goals. Admittedly, it’s wise to eat nutritiously and apply variety into your daily meals, but it doesn’t mean you have to forgo your favorite foods. That’s why these Manuka honey cashew butter muffins are such a delight. Rather than be filled to every available brim with added sugar, this recipe instead uses Manuka honey, providing its many raw benefits as well as its rich inherent flavor. Throw in some oats, bananas, and, of course, cashew butter (the oft too neglected cousin of peanut butter), and you’ve got one for the books! To begin, preheat your oven to 375 degrees Fahrenheit on the Bake setting, and then place 12 paper muffin baking cups into a muffin tray or spray the muffin tray’s cups with cooking spray (through baking spray with flour would work best for this). In a large enough bowl, mix the sultanas, the flour, the oats, and the baking powder before setting to the side. In a separate bowl, beat in the eggs before gently beating in the Manuka honey, bananas, melted butter, milk, and cashew butter. The mixture should be a liquid on the gloopier side. In your dry ingredients bowl, make a well at the center before pouring the wet ingredients in, combining quickly. Avoid overmixing – the wet and dry ingredients only have to be combined, so you can stop once no dry flour is visible. A batter that’s overmixed doesn’t work especially well when you’re trying to make fluffy, light muffins. Spoon the batter into the cups of your muffin tray and bake between 25 and 30 minutes until the tops of the muffins are a golden-brown color. Allow the muffins to cool down on a cooling rack. While it might be tempting, try to avoid eating any muffins straight out of the oven. Other than that, feel free to serve at your discretion. 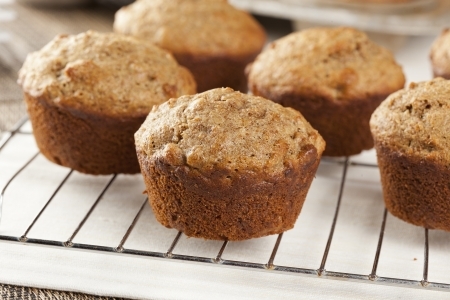 Enjoy your Manuka honey cashew butter muffins!